This photograph is arresting on so many levels. The year and the image. 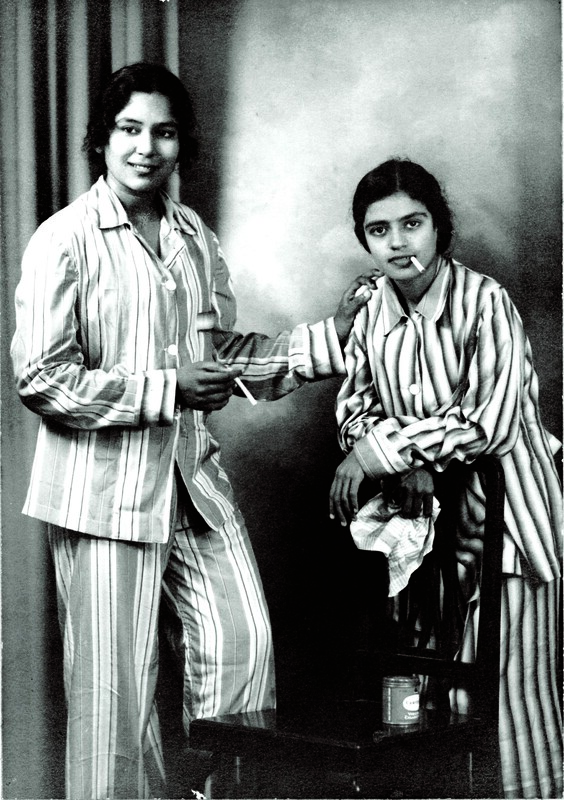 1937 and two Indian women dressed in western wear posing with cigarettes. There is also the fact of the unknown photographer as well as the unknown studio where this may have been taken. The blurb points to the background of the two women as coming from quite a conservative background. There would have been time spent in planning this. Finding the photographer who they seem to be quite comfortable with, arranging for clothes, the unsmoked cigarettes. Also knowing that this photograph wouldn’t find its way out. Keeping the print hidden, the excitement of the seeing this image, of a secret. The gaze – one outward, one straight into the camera. The hand of one on the shoulder of the other (posed?) The way they both stand. Balasaraswati looking like the one where the power rests, her left leg leaning against the chair. Her right hand holding the cigarette a bit awkwardly posed. Her smile and gaze fixed to a point outside. Subbulakshmi’s gaze right into camera, the cigarette between her lips sitting comfortably. Her hands relaxed holding the back of the chair and a handkerchief which I am surprised made it to the picture unless there exists one without it and this may have been a test run. A tin jar of something on the chair which could be the cigarette tin striking because of its irrelevance, almost like something the photographer forgot to move. With its performance of the masculine and the modern by women who could never have been seen like that in public, the photograph renders its own space of making as providing for the possibilities of what is not. Here’s Outlook’s review of the book that calls this photograph the “real masala”. This entry was posted in Feminism, Images, India, Photography and tagged Feminism, Gender, India, Photography on March 1, 2014 by Rashmi Munikempanna.